With just 2 games on Sunday the only story was Anthony Duclair (NYR 2013 3rd) as the young forward of the Quebec Remparts reached the 50 goal mark for the season. Duclair has been quite the story as he rebounded from a subpar 2012-2013 to a season in which he is flirting with 100 points. The leading goal scorer in the QMJHL Duclair was named the game's first star as his Quebec Remparts spanked the Shawinigan Cataractes 6-1 as Duclair really wasn't the star of the game as his teammate Mikhail Grigorenko had a 4 point game (3-1-4) but stick tap to the Cataractes for acknowledging a milestone even if it was against them. Duclair scored an even strength goal at 12:33 of the 2nd period which at the time gave Quebec a 3-1 lead. 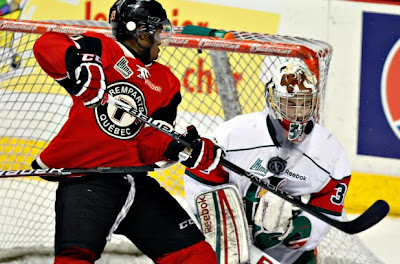 For Duclair the goal leaves him at 50-44-94 with 11 games left for the Remparts in the QMJHL regular season. More importantly for the Remparts the win kept the Remparts in 4th place in the QMJHL standings ahead of Ryan Grave's Val-d Or Foreurs and Loic Leduc's Rimouski Oceanics. The QMJHL may qualify 16 out of the 18 teams in the league for the playoffs but in the first round the top 8 get home ice. After Sunday's play the Remparts in 4th with 11 regular season games left have 75 points, Val-d'Or is 5th with 74 (12 games left) and Rimouski is 6th with 73 (13 games left). The team in 9th Rouyn-Noranda has 67 points with 12 games left. Duclair has to keep scoring to help his Remparts remain as high in the standings as possible. Loic Leduc's (NYI 2012 4th) Rimouski Oceanic may be just 2 points behind the Remparts in the standings but they hold 2 games in hand and after shutting out the Drummondville Voltigeurs 3-0 have also won 4 straight games. Leduc didn't score and only took 1 shot but he had 3 solid hits which fits more in what the Oceanic want from him. The Oceanic and the Remparts are in the same division but neither have a serious chance of catching the division leaders the Baie-Comeau Drakkar so they are fighting each other quite possibly trying to avoid having to play one of the 3 QMJHL Division leaders until the 3 round of the playoffs. Yes folks people are thinking this far ahead as before you realize it we will be talking playoffs.